All of which is to help me introduce Cretan cuisine, which is unfailingly sumptuous and never cretin in any sense of the (latter) word. “Restaurant row,” where everything is al fresco and the food, no matter which restaurant you choose, is sumptuous. Last night, we ventured to an unexplored neighborhood, one rich with handsome restaurants. There we found scores of tablecloth-covered tables under a canopy of sprawling grape vines, cooling in the soft breeze of the Mediterranean evening. 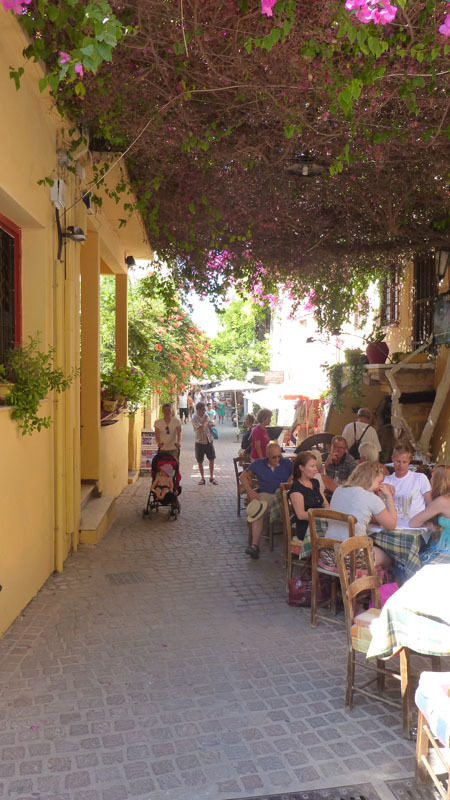 Since most restaurants in Chania are out of doors with tables on the sidewalks; and since this area was essentially nothing but a sidewalk, we literally walked through six or seven restaurants before choosing Taverna Strata. A few glasses later, and even more glassy-eyed from the Greek menu, “McGreeky,” our waiter, sat down beside Louise to explain every option. (Some may recall “McDreamy,” my neurosurgeon, from an earlier post. Louise is fond of naming her handsome Mediterranean men.) The restaurant is family owned; the recipes are all Grandma’s (of course), and by the time he finished, McGreeky had Louise drooling (I chose not to investigate the cause). How could we choose? “Have the combination plate for two!” Of course! A bit of everything: lamb, pork, beef, chicken, stuffed tomatoes, potatoes, stuffed peppers, stuffed vine leaves, stuffed eggplant, yoghurt dip, eggplant dip, a layered vegetable pastry, something made with phyllo dough and spinach – all served on a plate about the size of a manhole cover, with bread, olives, and herb butter on the side. 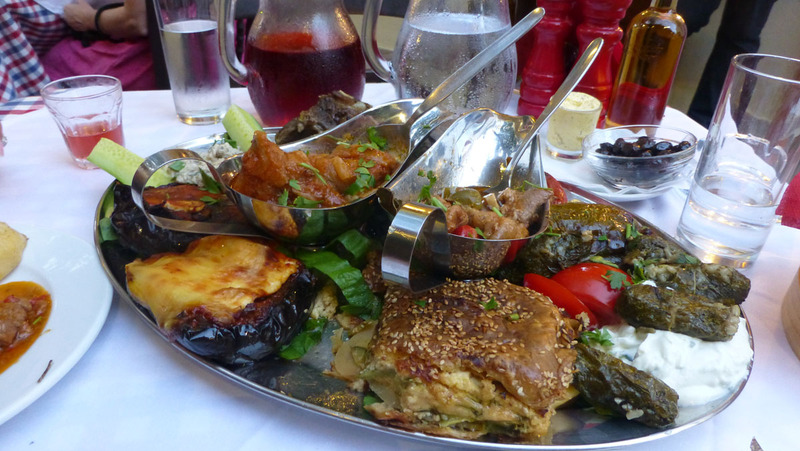 This may sound like a mountain of food – and it was – but the ouzo and the litre of wine emboldened us with confidence. We can do it! This was probably the most enjoyable dining experience of my life. Al fresco with a soft breeze and even softer chatter, personable service, and tons of remarkable food. Grandma knew what she was doing. And with that word – Cretan – I conclude. Hello (“yia sou”) from Greece and the lovely island of Crete, where the food, hospitality, and “on the house” are all noteworthy and exceptional. Your trip is getting better and better !! 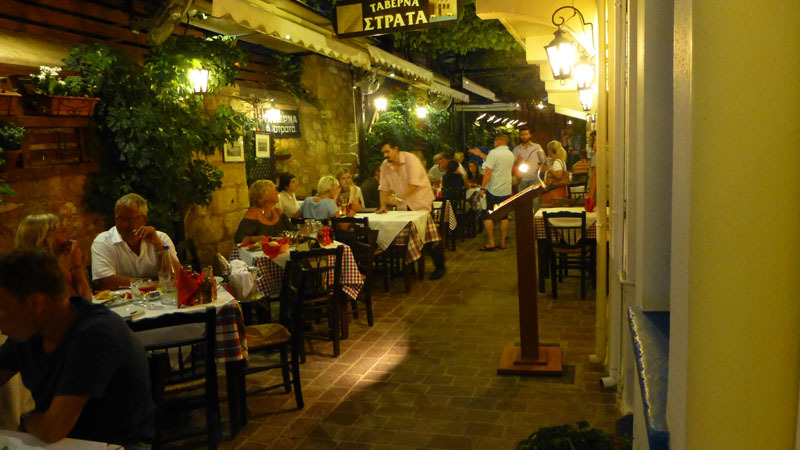 I remember the delicious food in Greece while reading your entry..
and check the food before deciding to sit at a table. I know that because my sister-in-law , who was married to a greek man (the spokeperson of the president of the time : M.Papaandreos) .was our hostess there one summer. We spent 1 wonderful month in the Mediterrenean city of Tiros on the Peloponese cost. flirting with your beautiful wife. Louis looks stunning on the pictures at the restaurant . Is this the reseult of the week she spent on the boat in the Canary Islands ? Please Louise , tell us about your week. Mapi, I will remember the compliment thing. She gets a lot of those; I’m glad to hear they’re compliments. How does one top 3 months in Girona and a week sailing in the Canary Islands ? 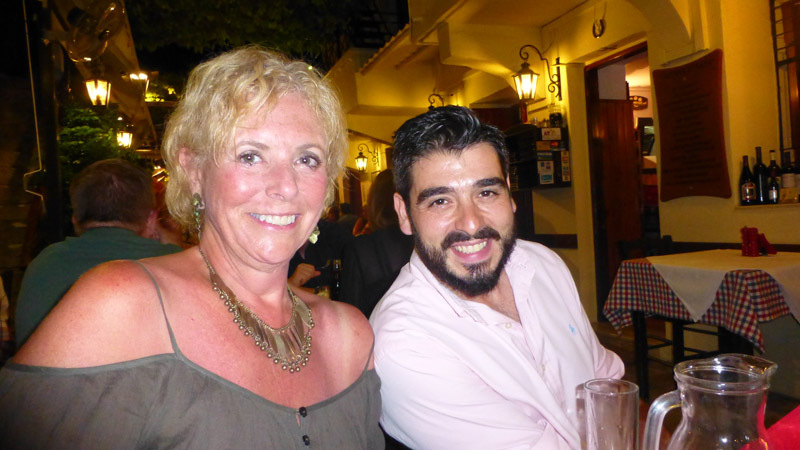 only by landing in Chania for a month – which of course you two have done with great success ! Amazing journey and thank you again for sharing the many treasures you are finding. Googled Chania and picture the two of you enjoining the sun and sea, and the food and ouzo. Look forward to reading more, and to reading about the Canary Island detour. Thanks, Marcia. We figured we’d ascended the apex of our adventure with Girona, but Chania gives us hope for even more. It’s ineffably beautiful, and as I’ve tried to convey, the food is sublime. 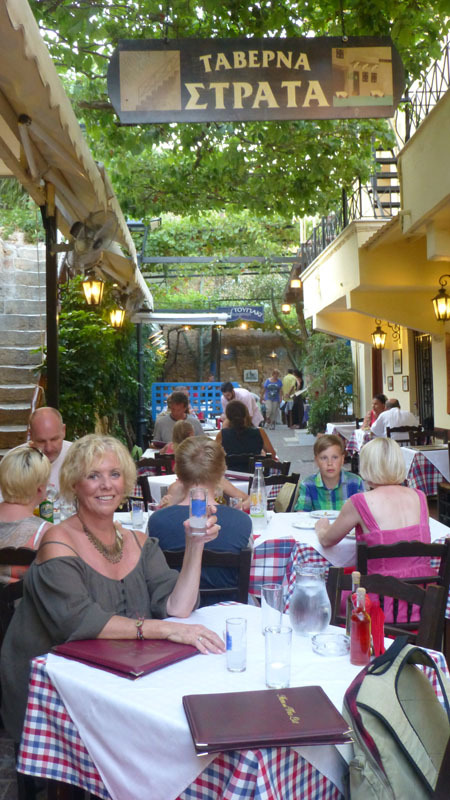 Thanks for a great post about Tavern Strata, i have been in Crete for many years, and the family who had the restaurant are my great friends.. I will send this post to the family, and i know they will be happy.. Thank you, Mads! Although we left a card containing the blog address with McGreeky, we would be flattered if you would reinforce our offer for him to read it. We’re here for a month and we’ll be returning to Taverna Strata again and again, and it’s always more fun when there’s a friend waiting.